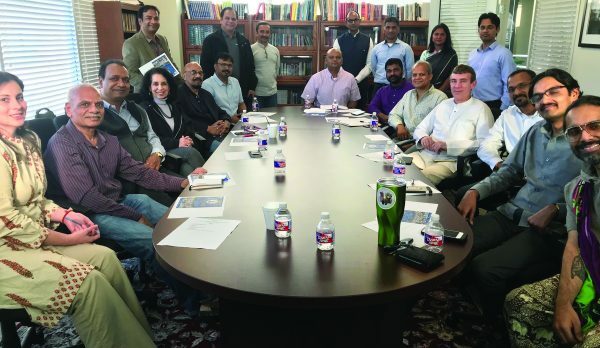 Representatives of numerous community organizations gathered at the Consulate General of India office with Consul General Dr. Anupam Ray (center) for the second planning session for the International Yoga Day celebrations in the greater Houston area. HOUSTON: The Consulate General of India in Houston with other organizations will host the International Yoga Day this year. There will be two events – on June 21, Friday at Mid Town Park, 2811 Travis Street, Houston, and on June 22, Saturday, at the Hindu Temple of Woodlands. Attending the planning meeting above are Jennifer Tummala, left, Sharad Amin, Sanjay Jain, Rahat Sultana, Col. Vipin Kumar, Raju Veludandi, Manish Garg, Parthasarathy Krishnaswamy, Girish Ranade, Consul General Dr. Anupam Ray, Deputy Consul General Surendra Adhana, Vivek Singh, Latha Kutuvanka, Amit Khanna, Madhukar Adi, Shekhar Agrawal, Mark Ram, Jayachandran, Vishwarupa Nanjundappa, and Saumil Manek. Several hundred Houstonians from all walks of life have attended yoga sessions held under the auspices of International Yoga Day in Houston and The Woodlands. The IYD has received considerable organizational support from the Government of India under Prime Minister Narendra Modi.